There are numerous types of yoga, each with its own strengths and focus. If you are looking for a practice that is focused on flow and is movement intense, yoga nidra is not for you. Yoga Nidra, also known as yogic sleep or sleep awareness, will help relax you and bring you into a deep meditative state of consciousness. If yoga nidra is a new style for you and you are deciding whether it is the right one for you, here are a few things to expect. The focus of the practice is on relaxing the state of mind and becoming aware of it. It is a guided meditation that is aimed to calm and heal the self. Those that experience anxiety and/or tension often practice this style. All you need to bring to class is a yoga mat, light blanket, and yourself. 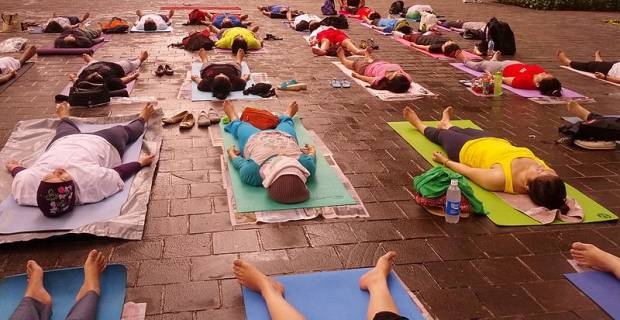 The yoga instructor will have you start in savasana (corpse pose) and will guide you through the rest making you more aware of your body and help guide your thoughts. While it may be very easy to relax too much and fall asleep, it is important to stay awake and focused on hearing and being aware of the body. The more one practices, the deeper one can get into the subconscious and superconscious. If you are already practicing a different style of yoga, yoga nidra can be added to the end of your practice allowing you to cool down and relax the body. It can also be a complete practice of its own that can be done either under the guided direction of the instructor, or for the more experienced, from the comfort of ones own home. If you are interested in learning more about yoga Nidra, the yoga master, Swami Satyananda Saraswati is the one who developed this style and has a book looking at it more in-depth. There is a plethora of information available online as well which will help guide you in your practice.